Funny old game, Zen Pinball. Between myself and the children, we can go for weeks, even months, without looking at it, but as soon as somebody starts it up out of boredom or carelessness, everybody’s hooked till we have to shut it down for meals, beds, education and other insignificant events. The latest tables, based upon an obscure sci-fi oddity released just before Christmas, is a predictably addictive and faithful addition to the collection. It seems stupidly obvious for me to type, “if you like pinball and Star Wars, you’ll love this”, but that pretty much covers it. They are pinball tables. They are based on The Force Awakens. They’re great. Review done. But I’ll try to elaborate. The first table is set on Rey’s home world of Jakku and is the lighter and more cheery of the pair. BB8 rolls about, tentacled monsters whose name I can’t recall attempt to catch your ball, and TIE fighters swirl around all to a soundtrack taken from the classic but cheesy final scene of A New Hope. 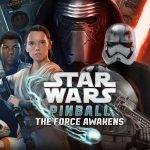 Huge Star Destroyers descend to be attacked, and eventually BB8 does exactly what you’d hope a ball shaped droid in a pinball game would do. The vocal clips are as close to authentic as you can realistically ask for, and it generally looks and sounds fantastic. It plays beautifully too, and has enough different elements to keep people considerably more skilled than me playing over and over. The second table is based upon the First Order, and so is inherently darker and more brooding. Excellent new baddie Kylo Ren is all over this one, and the music from the trench run (again from A New Hope) adds a sense of foreboding and urgency to the proceedings. Underused Captain Phasma also appears, but we really see as much of her as we do in the film, i.e. not much. 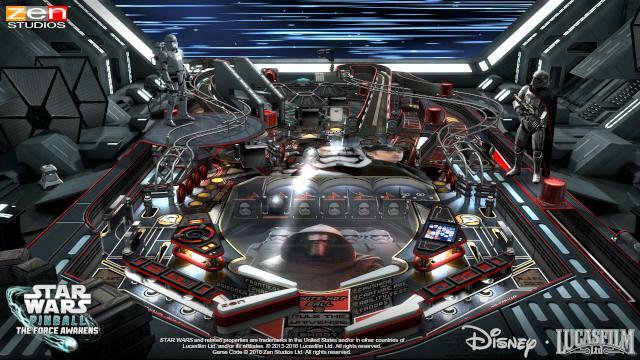 Overall, the Force Awakens table is probably the most fun, but the two tables really work best as a pair. Because their gameplay and aesthetics are so different, swapping backwards and forwards between the two keeps them both fresh and helps you appreciate their differences. I didn’t really want things to end this way, but it always seemed somewhat inevitable. 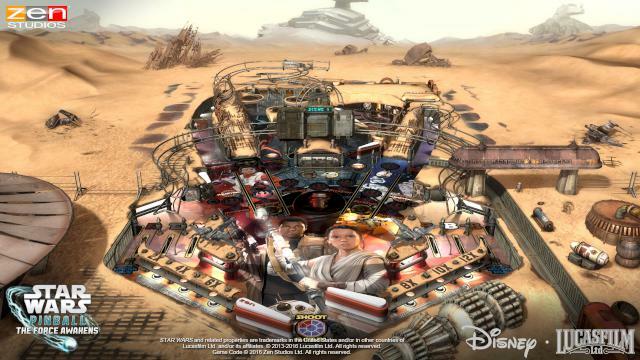 If you like pinball, and you like Star Wars, you’re going to love this.